Immersible connectors have to meet a variety of mechanical and chemical constraints. SOURIAU has been active in this market for a very long time, continuously adapting its product range to customer requirements in the field of military submarines, oceanography, geophysics and the oil industry. With SWIM, SOURIAU is launching a new range of underwater connectors designed for new markets. The new SWIM range (Shallow Water IMmersion) is designed for marine applications in depths down to 300m, which are considered shallow immersion. These connectors are designed for innovative applications like surface drones for environmental evaluation missions, maritime surveillance equipment, oil exploration, weather buoys, commercial diving and even for OCROVs (Ocean Class Remotely Operated Vehicles). Using surface drones for oceanic observation requires them to have connections to numerous sensing devices (hydrophones, temperature sensors, salinity sensors etc.). The SWIM range satisfies all these connection needs. The assumption that "if you can do more, you can also do less" is not always true. For example it is not because a connector is watertight at great depth that it will be equally so in shallow water. The watertight design has to take into account the pressure exerted on the seams, and therefore the immersion depth. With SWIM, the connector plug is screwed into the receptacle to lock both parts together and two O-rings at the mating interface ensure the connection stays watertight even at low pressure. The molding of the cable to the plug adds to the watertight protection. Manufactured in thermoplastic material, SWIM is resistant to seawater and temperature variations between -20 and +70°C over long periods. The screw mating and the coding pins make it easy to blind mate the plug with the receptacle, even with a large number of pins. SOURIAU, a specialist in connectors for harsh environments, supplies customers in the field of submarines, offshore oil installations, renewable marine energy and oceanographic research with its range of connectors which are watertight, reliable and long-lasting thanks to their mechanical robustness and resistance to vibration, shock and corrosion. For its marine connectors, SOURIAU uses many different kinds of material such as bronze, stainless steel, titanium and Super Duplex steel. As well as custom products developed in collaboration with customers, we offer connector ranges suitable for most applications. Vincent Mansour, Product Manager Marine: "Marine connectors contribute to system reliability by facilitating maintenance and increasing the modularity of the architecture. In military vessels, they resist the effects of shock and vibration and the "step" test. In a submarine, they ensure the continuity of the electrical connections between the watertight sections as well as connecting the on-board electronic equipment with the external sensors. For other commercial applications, for example to interconnect divers or Remotely Operated Vehicles (ROVs), SOURIAU connectors provide minimum external dimensions combined with high pin density and total reliability. Vincent Mansour continues: "We do all our manufacturing, assembly and product testing in-house, and our vertical integration gives us the flexibility and reactivity we need. 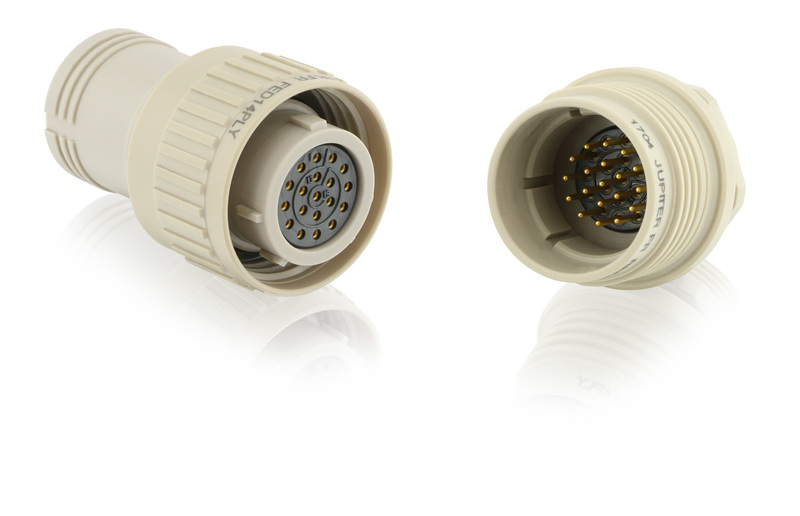 The development of new connectors in close collaboration with our customers gives us a lot of freedom to design to very specific requirements. Although most of our business in marine applications is currently in France and the UK, we are well enough known to be able to develop the US market too, through our network of representatives and distributors, as well as in Asia, principally in China, Japan and Korea." Follow this link to learn more about our SWIM series and download the technical datasheets. Check this page if you are interested in our other underwater connectors.